Home Arizona blog comic gloves hard hat industrial hygiene Industrious Hygienist Nick Thorkelson NIOSH off the job safety OSHA safety worker exposure Yay! for NIOSH's First Comic: "Straight Talk About Nail-Gun Safety"
Yay! for NIOSH's First Comic: "Straight Talk About Nail-Gun Safety"
So, no surprise, while surfing the 'net for something neat to post about, I came upon some exciting news: NIOSH released their first (ever) comic in June 2013. The comic is titled "Straight Talk About Nail-Gun Safety" and discusses pneumatic nail guns. FYI, careful while searching for images on Google re: "pneumatic nail gun" and "movie" - I tried to find a movie reference/still for visual emphasis, but all that showed up was "Nail Gun Massacre." Not hyper-linked since I am not overly fond of horror movies. According to the CDC NIOSH Science Blog, this comic is intended to raise awareness of nail gun safety measures, prevent injuries, and dispel some myths about nail guns circulating around the internet. 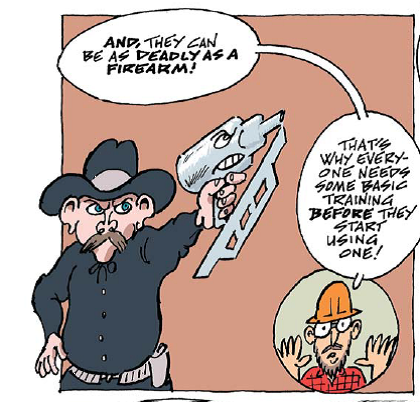 CDC NIOSH / Nick Thorkelson comic, "Straight Talk About Nail-Gun Safety"
The comic has a middle section with a nail gun safety checklist that explains nail gun trigger safety, nail gun use, concerns about lumber and building materials, and reminders about compressors and hoses. "Most sites that appeared immediately were legal or medical, though they quickly digressed to include �theatrical�, paranormal, and vampire-hunting (using silver nails, we presume) interests. Narrowing the search to �scholarly� sources, we found several peer reviewed papers that referenced a nail firing velocity of 1400 ft/sec and others that reported different velocities. (Just to note, no articles were found using these search terms in PubMed or MedLine). All articles except one were medical journal case reports of nail gun injuries." The CDC seems to be more interested in visual media, since the release of the CDC public health graphic novel, "Preparedness 101: Zombie Pandemic." Comics and graphic novels are a great way to engage the public and workers - telling a story in a way that can help memory retention while entertaining. Nice job, Nick Thorkelson (artist).